Police Day is annually observed in Armenia on April 16. This is a relatively new celebration, that was established in 2002. 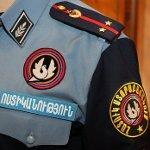 The National Assembly of the Republic of Armenia adopted the Law on Police on April 16, 2001. This document described the concept of the Armenian Police, its tasks and powers. It also described the rights and duties, legal framework and principles, structure and procedures of the liability, the state guarantees of social and legal support. It also refers to the principles of control over funding, logistics and activities of the Armenian police. The first observation of Police Day took place in 2002, in a year after adoption of the law. Annually the police officers accept congratulations from President of the state and police officials. Another traditional celebrations of Police Day celebration are military parade, ceremony of wreath laying at the graves of the officers, who died in the line of duty. A special concert for the police officers is organized in the evening.